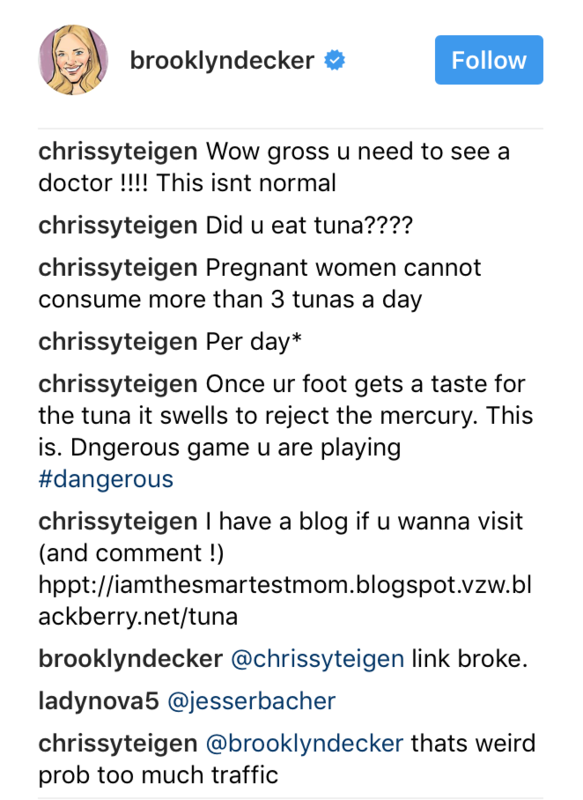 Let us begin this post with the expression “LOL” because it perfectly sums up Chrissy Teigen’s purposefully-ironic trolling of her best buddy, actor Brooklyn Decker. I did not chop my hair, nor did I get a perm- but I DID become a Blondie. I'm posting this because @mdjhair is wonderful; if you're in Austin and want beautiful color- she's your gal. A quite pregnant Brooklyn took to Instagram Wednesday to share a relatable photo of a familiar puffy, pregnancy-induced condition – cankles. Chrissy, who has been the target of relentless mum-shaming since day dot, quickly jumped in, flexing her expert trolling muscles with impressive pace and faux-snark. Before you get the wrong idea, the reason Chrissy trolled her buddy was not rooted in malice. Rather, she was trying to preempt the mean responses she knew her friend would get in the comments under the pic. Because that’s what many people are like, online. Mean. Sigh. “I don’t even know where my leg ends and the foot begins anymore,” Brooklyn posted alongside her puffy cankle pic. I don't even know where the leg ends and the foot begins anymore. Game was then well and truly on! Chrissy returned serve with some classic troll moves, before other less-accomplished types could pile nastiness on her friend. She posted a series of comments, each more high-horsey than the one before and it’s got us giggling – and wishing there were more! “Wow gross u need to see a doctor!!!! This isn’t normal” Chrissy posted facetiously under her friend’s pic. Warming up to the task at hand, she then took things up a notch, with some faux-accusatory blaming and shaming. The whole exchange is pretty funny, but it again highlights how much flack high-profile women are subjected to, and how much second guessing goes on when celebrities post anything to social media. It’s also obvious that these two are firm friends, and we’re kind of jealous. What could be better than Chrissy Teigen having your back?! I could not be happier for this woman. I met her backstage 7 years ago and within minutes I had this feeling she was going to be a star. She's selfless as can be, and I'm lucky to call her a friend. I'm so happy you're changing the game and conquering what you love! @chrissyteigen book out today ! Get it!